Search for the best flight prices from Stansted to Washington D.C. Compare prices, book today and save money with Stansted Airport. The capital city of America and a world leader in democracy, Washington D.C. is a non-stop showcase of everything American. With a history that dates back to the revolutionary war, Washington D.C. has played a key political role during many major historical events, transforming its landmarks into globally recognised icons. As you walk by the Lincoln Memorial, the U.S. Capitol and the White House it’s easy to become captivated by both their grandeur and the principals that they represent. While there’s a lot of American history in and around the city, Washington D.C. is also a hub of science, industry and culture, offering fantastic experiences for all tastes. With a variable climate that reaches highs of 31°C in July and lows of -3°C in February, every season gives you the chance to see a different aspect of the capital. Washington D.C. also has a bustling social calendar filled with American traditions, spectacular performances and festivals from every culture that calls the cosmopolitan city home. With so much to offer, it’s easy to see why 24 million visitors flock to the city annually. Playing host to many senators and foreign nationals, as well as tourists from all over the globe, Washington D.C. has hotels and accommodation to suit any budget. If you’re looking for a rustic American experience, you can stay at the Hay-Adams which boasts a colonial charm that’ll immerse you in the city’s rich history. For a completely different atmosphere, you could book a room at the modern Asian-themed Mandarin Oriental which is renowned for its incredible spa facilities. There’s even the option to stay at the Trump International Hotel that combines modern convenience with the historic allure of the Old Post Office location, which dates back to 1899. Whether you’re searching for upmarket boutiques, big name brands or niche specialists, shoppers can find anything they’re looking for in the city. Fashion-conscious travellers will want to visit the upmarket Georgetown and the bohemian U Street to pick up deals on the latest fashions and find every designer brand imaginable. Other shoppers may want to check out the Chevy Chase & Friendship Heights district, where they can find four malls to explore, or the huge Fashion Centre Mall. No matter what cuisine you’re in the mood for, Washington D.C. has hundreds of bars and restaurants to suit your tastes. If you’re looking for a fine-dining experience, the Lafayette Restaurant offers world-class service and a menu to match – as well as views of the White House. For breakfasts and brunches, you can enjoy the Ambar Capitol Hill which offers a mix of Balkan Cuisine and classic American dishes. And when you want to try something completely different, the local-favourite Keren Restaurant has an authentic range of traditional African foods to try. Wherever you choose to dine, booking in advance is a must as many restaurants are reservation only. Washington D.C.’s regular Christmas celebration, the National Christmas Tree Lighting, takes place in late November as the President lights the Christmas Tree on the White House lawn often accompanied by music, fireworks and other entertainment. This starts a festival throughout December in the run-up to Christmas called the Pageant of Peace with many seasonal festivities. If you’re visiting around this time of year, it’s a brilliant way to find a little extra Christmas cheer. 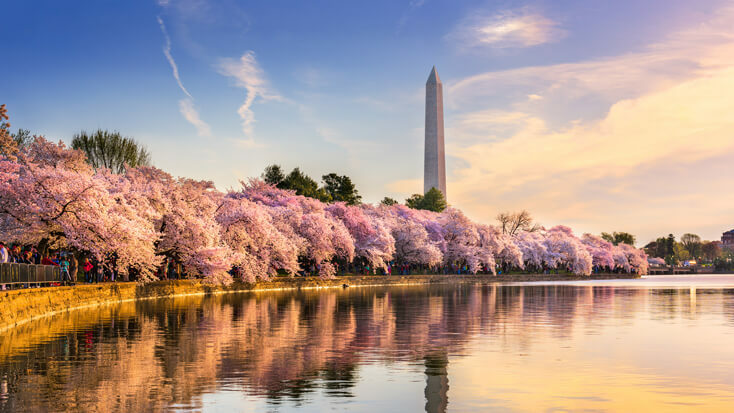 Marking the start of spring in Washington D.C., the National Cherry Blossom Festival commemorates a gift of cherry trees from the Mayor of Tokyo in 1912. The main event of the day is a parade throughout the city, followed by immersive art experiences and live music. It’s a unique experience, even for those familiar with American traditions. The height of American Patriotism, Independence Day celebrates the freedom of the country from the British Empire. It’s a spectacular celebration with parades and musical performances throughout the day as well as a gigantic fireworks display in the evening. A day of remembrance across America, Memorial Day is a national holiday with heartfelt tributes paid at many military cemeteries. The President visits the Tomb of the Unknowns and lays a wreath to honour all the men and women who died in battle and were unable to be identified. This is a brilliant time to visit national memorials and gain a deeper understanding of America’s relationship with its armed forces. Starting as a block party between the residents of Washington D.C.’s deprived H Street, the H Street festival became a way for the area to use the art of its residents to encourage economic growth. The festival, now taking place in September, has become one of the most popular events in the city and is a celebration of the art and culture of Washington D.C.’s citizens.